The California Gate, comprised of two blocks of Sardinian granite 2’ thick and 13’ tall engraved with images of art and nature, and a space between them in the shape of the state of California. Nearby is a granite bench the same size and shape as the “missing” piece from the gate, etched with depictions of California’s waterways. 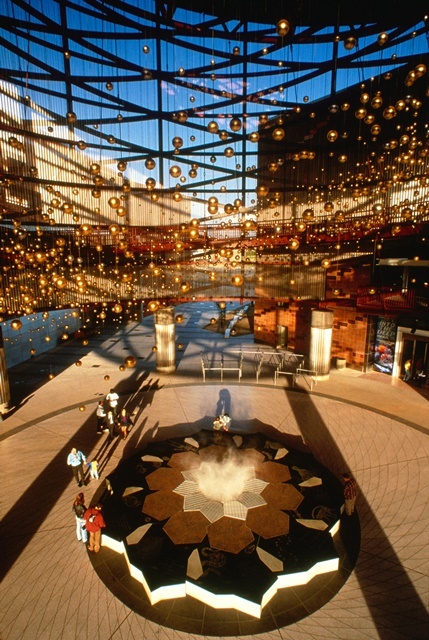 The installation was designed contemporaneously with the building and plaza architecture and installed during the building and plaza construction. 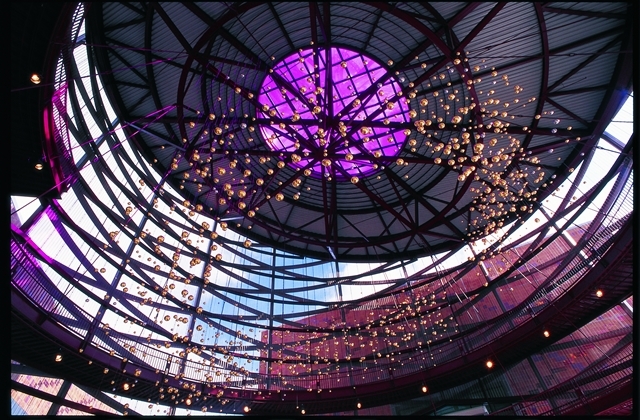 Specialty craftsmen from the United States worked in conjunction with Italian stonemasons for the stone pieces, while The Aerial spheres were hand crafted in Portland, Oregon. 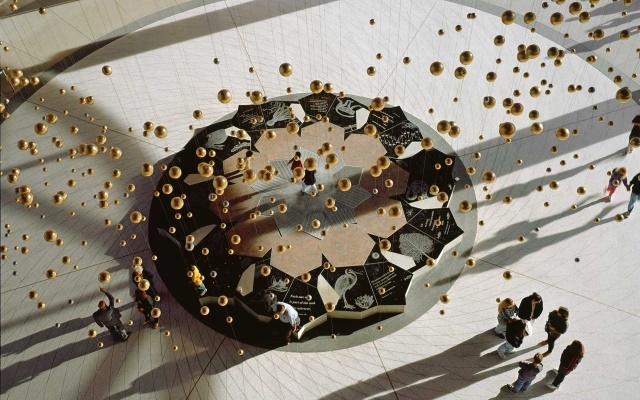 The project was not only artistically and spatially complex; in addition, the management of the design, fabrication, and installation components involved materials from 3 continents as well as working within the confines of multiple State and private restricted funds. 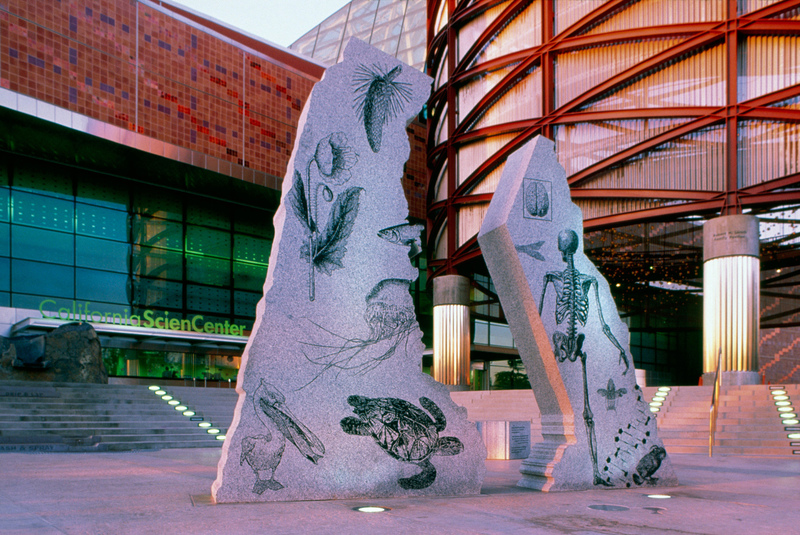 While staff Owner’s Representative at the California Science Center, Barbara managed the intricate project team comprised of Larry Kirkland, members of Larry’s studio and United States and Italian specialty consultants, and the international installation team comprised of both American and Italian stonemasons. Barbara also conducted progress visits to the Portland fabrication studios and the Italian quarry and stonemason’s workshop.